Riding high following their commanding 6-1 victory over the Bakersfield Condors Saturday night, the Roadrunners situate themselves their second visit of the season to Citizens Business Bank Arena to take on the Ontario Reign. It will serve as the Roadrunners’ second game in just 20 hours; the club is fresh off matching its highest margin of victory with a record-setting offensive performance that saw the fastest three goals scored in club history in a 2:08 span, and the first-ever five-goal period. 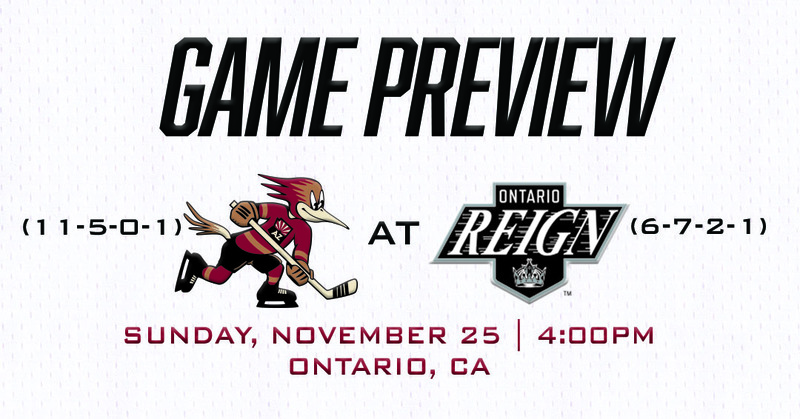 Scoring was the storyline in the team’s previous visit to Ontario on October 26, when they matched a team record eight goals netted in their 8-5 win over the Reign. 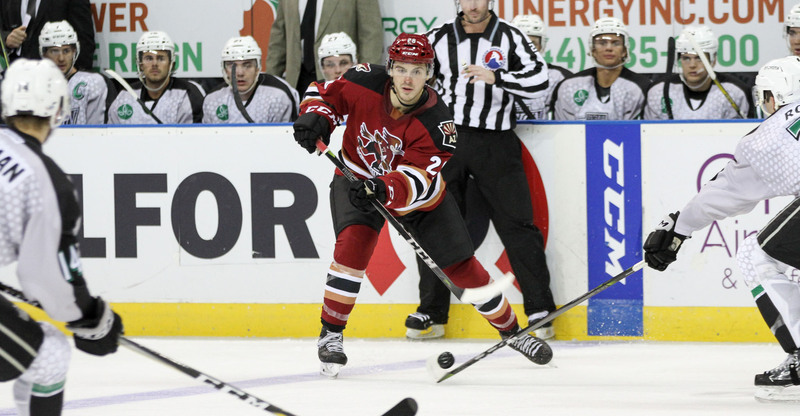 Each of the Roadrunners’ next two games will be played at Citizens Business Bank Arena, the next coming a full week after this afternoon’s affair on Sunday, December 2. Ontario, with a day of rest in-hand on the Roadrunners, is coming off of a 4-2 home loss to the Condors on Friday, Bakersfield scoring three third period goals to earn the win. The Reign are 3-2-2-1 on home ice this season. Due to the quick back-to-back nature today’s contests beholds, there is a chance goaltender Merrick Madsen could make his fifth start of the campaign. The Roadrunners are 5-0-0-0 this year when playing two separate teams on the road in consecutive nights. FEELING AT HOME: Dating back to last season, the Roadrunners are 4-1-0-0 in their previous five visits to Ontario’s Citizens Business Bank Arena. They’ve had a strong knack for scoring in the Reign’s home building, posting a total of 24 goals during that stretch, averaging 4.8 per game as visitors in Ontario. The Reign allow the second-highest median of goals per game in the AHL this season, surrendering an average of 4.19 to opponents. BURKE GETTING BUSY: For the first time in his young professional career Saturday, Brayden Burke registered multiple points as buried a pair of goals to polish off two separate fast break three-on-one rushes. He now has four goals in his past eight games. In the Roadrunners’ previous visit to Ontario, he earned his first professional point with the secondary assist on Hudson Fasching’s first period goal. ROBBIE’S ROLLIN’: Defenseman Robbie Russio, with a pair of assists Saturday night, now has points in five of his last six games, and is tied with Kyle Capobianco for the team lead in assists and points for a defensemen (11). He and Capobianco are also tied for 8th among AHL defensemen in assists registered. Russo’s multi-point game Saturday was his fourth of such this season. SEVENTY-EIGHT [POINT] TWO: Merrick Madsen’s hometown of Acton, CA is roughly 78.2 miles from Ontario. That, depending on Southern California traffic, is about a one-hour and twenty-minute drive.